The approach to Santorini (Thira) by ship was impressive and there was a buzz among the passengers as we drew closer. 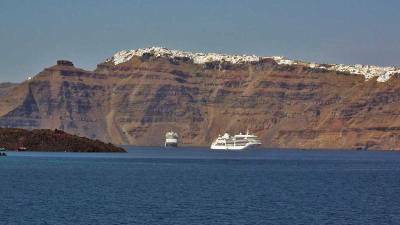 Santorini doesn’t have a port dock for cruise ships, so you need to take a tender to get to a Santorini Shore Excursion. 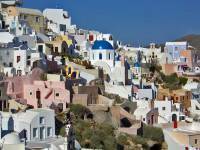 You can reach the caldera edge villages of Fira and Oia by four ways. 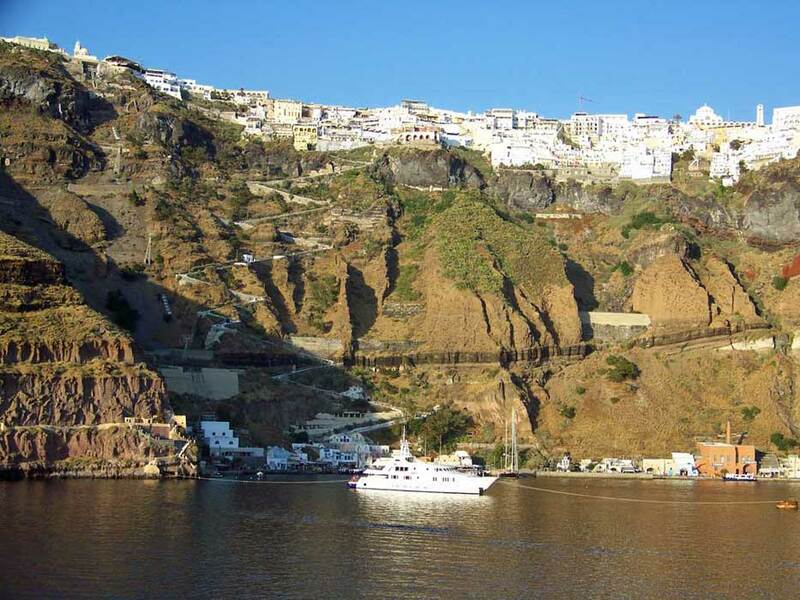 Three of the ways to reach to the caldera edge are from the tender Old Port or Skala, where you can walk up, take a mule ride or catch the cable car. The fourth way to reach the caldera edge is to tender to the ferry port at Athinios and take a bus. Our Santorini Shore Excursion to Fira & Oia started with a tender ride to the Ferry Port at Athinios, where we caught our bus. The bus twisted and turned up the switch backs. 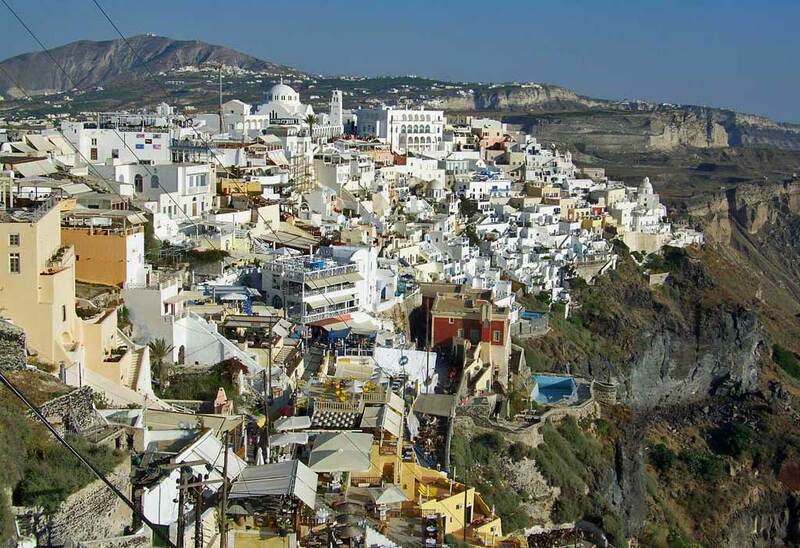 Then we followed up with a twisty turning bus ride across the island to the town of Oia. We fought off motion sickness and oppressive heat when we got off the bus and began walking. 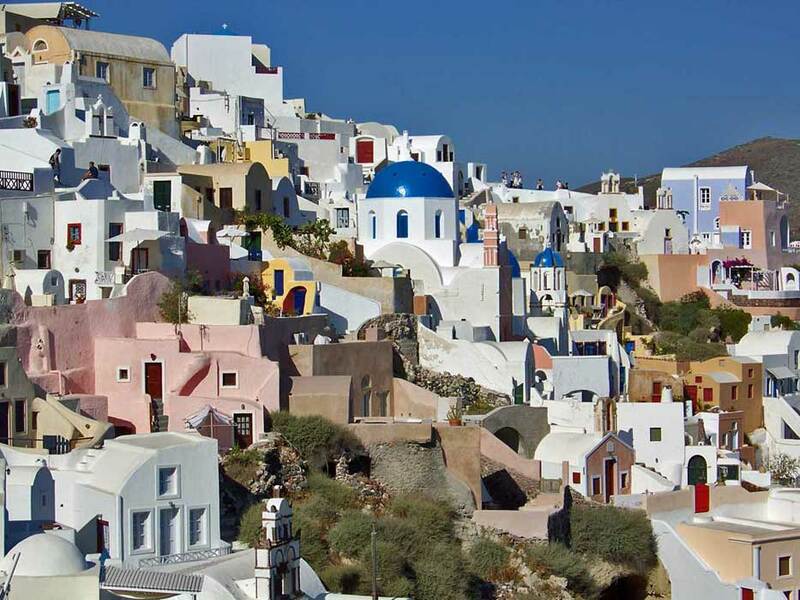 When we reached the main street of Oia, all this was forgotten. 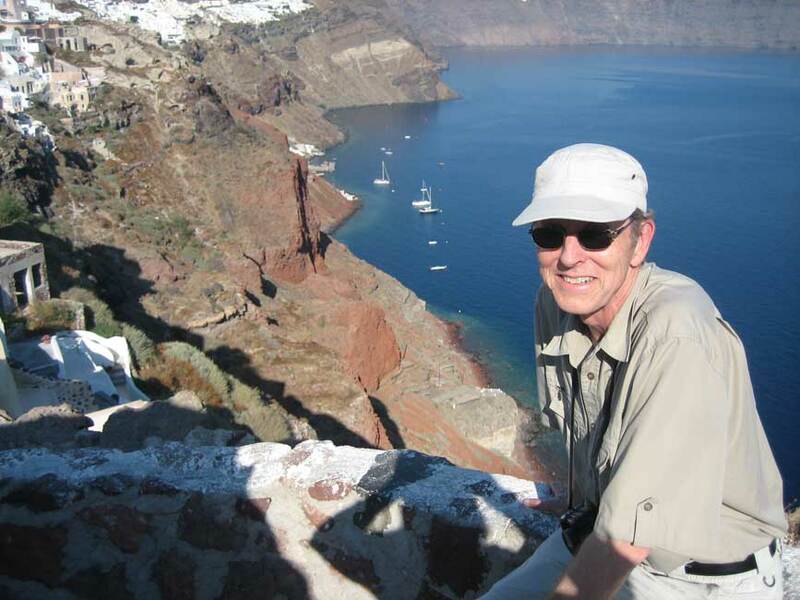 The walking portion of our Santorini Shore Excursion began in Oia. 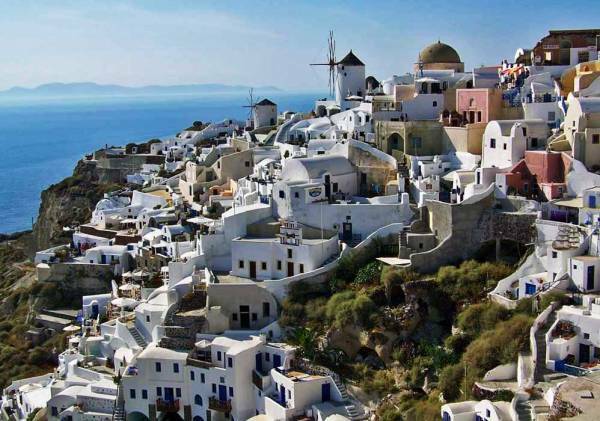 The village of Oia is simply inspiring. We grabbed some inexpensively priced soft drinks and walked a short distance to a spot the tour guide recommended for pictures. The views and atmosphere in Oia was almost unbelievable. We took pictures of the city in one direction and the blue domed churches clinging to the cliffs in the other direction. Then we sat in the shade on the caldera edge to recover from the heat and enjoy the views. As we did, people kept coming on to the two viewpoints and saying “Oh my God.” One person said, “Why do I not live here?” We shared the enjoyment with lots of fellow visitors. As I looked out to the west, I noticed the famous Oia sunset viewpoint in the distance. We were instantly revived and rushed along the path to the Oia sunset viewpoint. On the way, we had to yield to a local wedding procession in the street. 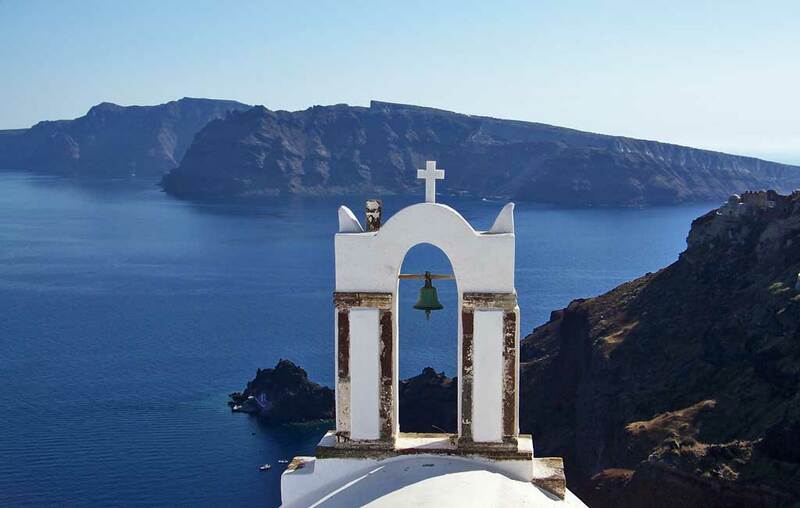 When we reached the Oia sunset viewpoint we felt like we were living in a postcard. 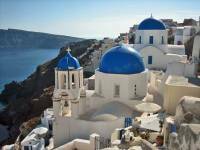 After that Santorini shore excursion highlight, we took the bus to Fira. 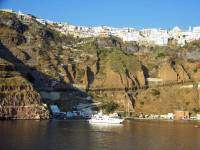 After wandering the streets of Fira, we took the exciting Fira cable car down to the Old Port and the Skala Pier. The Fira cable car passes above donkeys carrying people up and down the caldera edge. 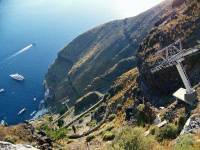 From the Skala Pier at the base of the Fira cable car, we tendered back to our ship. Our ship sailed out into the setting sun past the Oia sunset viewpoint. Flash bulbs were going off all over the city as people tried to catch the sunset with their cameras. Santorini was a dream.